Continue on to see the full list of items included and addressed in this game update. This update is a heavily influenced by your community feedback. Make sure to give us more feedback on the official forums here. 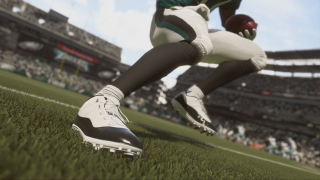 Updated the Player Exclusive Retro cleat to reflect the latest model being worn by NFL players this season. This includes the new Air Jordan XI Concord worn by players like Bobby Wagner, Michael Thomas, Alshon Jefferey, Jalen Ramsey and more. DEV NOTE: We are excited to announce that for the first time in Madden history, we can now support Playbooks via Title Updates. This has been a long-time goal of the Madden Dev Team. These Playbook changes are the first of many we hope to do as we move into the future. DEV NOTE: There are still other ways to get the 10-second runoff penalty called, such as after a False Start when the necessary rules conditions are met. DEV NOTE: When breaking down some of the exploit setups being used with the 3-3-5 Odd and other similar formations, we found that this problem was caused by a contain rusher either rushing the B-gap or rushing the same gap as the adjacent pass rusher. Since the design intent of the QB Contain assignment is to counter QBs scrambling outside the pocket while NOT being a pass rusher, we have made some adjustments to support that intent. 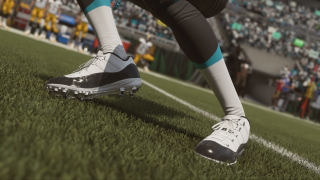 We have made tuning changes to force them to rush wider, as well as continue to play contain in cases where they cannot be blocked by the offensive line (which means they will not rush the QB after a few steps if they are not blocked, but will continue to break on scrambling QBs when in the contain assignment). If you want that player to rush the QB for the entirety of the play, he needs to be assigned a pass rush assignment via either play call or a hot route.